Last month saw the completion of one of the most significant deals in the technology sector in more than a decade. On September 7, US firm Dell Inc completed its $67bn acquisition of EMC Corp, a deal second only to AOL and Time Warner’s $106bn tie-up in 2000. 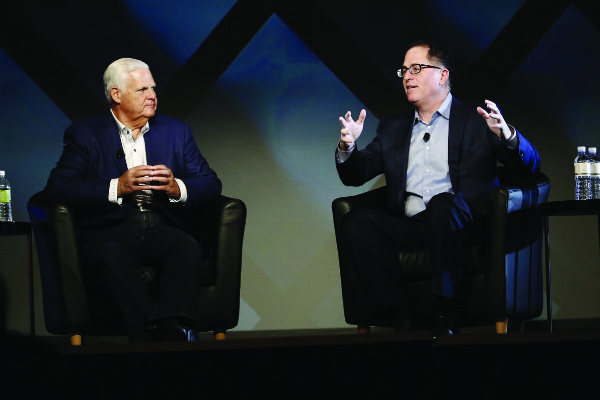 The combination, now called Dell Technologies, creates a $74bn company with a product portfolio stretching from PCs to servers, hybrid cloud, storage, cyber security, analytics and platform-as-a-service offerings with repercussions across the technology world, including the Middle East. “We certainly feel this is quite a historic event in our story and from our perspective it’s a very bold move in defining our company but also defining our industry,” says Aongus Hegarty, president of the Europe, Middle East and Africa region at Dell EMC. The consequences of the deal are far reaching. The combined firm not only serves 98 per cent of the Fortune 500, but also includes a number of other companies. Among them are cloud integration unit Boomi, software and services firm Pivotal, network and computer security companies RSA and SecureWorks, cloud computing software specialist Virtustream and virtualisation company VMware. All under the umbrella of the world’s largest privately controlled technology firm. It also comes at a time when IT spending in the Middle East is growing, with a forecast increase this year of 3.7 per cent to $212.9bn – rising to $242bn by 2019, according to Gartner. But what will the deal mean for customers in the region? Hegarty suggests the impact will be immediate. Companies that previously did business with both firms will now find the teams serving them have combined into one, while more broadly they will notice combined engagement in terms of activities and events. “That’s what we will have immediately in the UAE,” he says. What this will mean for the company’s existing offices in the region is not yet clear. Hegarty says decisions will be made to make the best use of the company’s physical space in the coming weeks and it may even need to expand in some locations. “We’ll obviously need more room to expand the solutions centre we have in Dubai because with the breadth of technology combining dell and EMC we’ll need additional space and additional area from a solution and breathing point of view,” he says. On the management side at least there will be some familiarity to proceedings. Mohammed Amin, EMC’s current senior vice president for Turkey, Eastern Europe, Africa and Middle East (TEEAM) will take the role of Middle East and Africa regional head from February 2017. While Dell’s general manager for MEA and Turkey Driss el Ougmani will take another “very important role in a key business unit,” according to Hegarty. This is not to say there aren’t other changes on the horizon. Prior to the closing of the deal in June, Dell announced it would be selling off Quest Software and security company SonicWall along with unspecified other units to private equity firms Francisco Partners and Elliott Management. And now the merger has been completed a number of cuts to the combined 140,000-strong workforce are expected in areas where the two companies overlap. Around 2,000 to 3,000 global redundancies are expected, with the majority focussed in the US and in areas including supply chain, general and administrative positions and marketing, according to reports from Bloomberg. When asked, Hegarty confirms the company will be making some cuts in the Middle East. “Yes there will be some limited realignment of our team and organisation as we highlight priorities,” he says, declining to give numbers. Although Dell has also been seeking to differentiate the deal from your typical large-scale merger. According to Bloomberg, Dell Technologies is looking for to save about $1.7bn in the 18 months after the deal, but it also expects a significant boost in sales. Among the key ways the company intends to do so is through the cross selling of Dell products to EMC customers and vice versa allowing it to serve a broader segment of the business IT market, from end user computers, to data centres and server side networking, cloud and storage. Whether this new combined approach proves effective remains to be seen. A survey conducted by Dell and EMC in November last year found that 75 per cent of IT decision makers saw the merger to be beneficial to their business, while 92 per cent said that they expected to increase or maintain spending with the combined entity. Hegarty suggests this is proof the combination is more attractive to companies as they can now go through one vendor for many of their IT requirements rather than two or more. But there may still be some that seek to diversify to reduce their reliance on a single firm. Building on this combined approach, the company will seek to gain a wider share of the hybrid cloud market, expected to be worth $241.13bn globally by 2022 from $41.15bn today, according to Research and Markets. “We see more companies in a hybrid mode, certain applications and elements of their data centre and cloud on premise in a private cloud type environment and then leveraging public cloud for particular application and requirements,” he says. But perhaps its biggest challenge will be in proving that bigger is better in an IT landscape where rivals including HP and IBM are downsizing and separating business units. In this, Hegarty suggests the company’s key strength will be that it is privately owned after Michael Dell’s $25bn deal to take Dell private in 2013, meaning it will not have to answer to shareholders. “We’re very conscious of making sure we have the agility allowing us to innovate like a start-up but also have the strength to invest in significant scale R&D,” Hegarty says, referencing plans to invest $4.5bn in research and development annually in the coming years. “That’s what a privately controlled company allows you to do. Now with Dell Technologies combining EMC and VMware all of the elements are coming together and the combined company will benefit from that view. Whether this argument can win over hearts and minds, and perhaps most importantly IT wallets, will be put to the test as the company hosts its first Dell/EMC combined customer and partner events in Riyadh, Dubai, Abu Dhabi and Cairo in the weeks and months ahead. Dell World 2015: Is the Middle East future ready?